Well, that’s one way to get your attention. 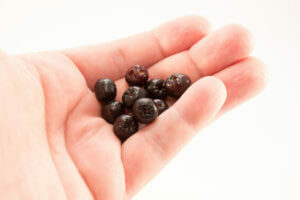 Aronia berries are certainly an up-and-coming star in the world of superfruits. 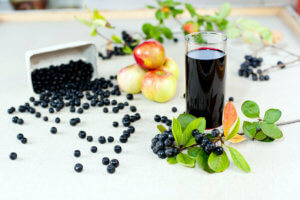 As you’ll find out, studies have shown that aronia berries have potential health benefits. We all want to eat healthy. Wouldn’t it be nice if eating healthier made us feel better more quickly? Superfruits, or fruits high in polyphenols, may do just that. A whole host of research suggests that certain foods containing polyphenols, including aronia berries, can provide great health benefits. Aronia berries, which are also known as chokeberries — because of their sour taste — can be found in parts of North America, though certain varieties touted for their antioxidant benefits come from Europe. They grow on ornamental plants or bushes. They’re actually great for landscaping. 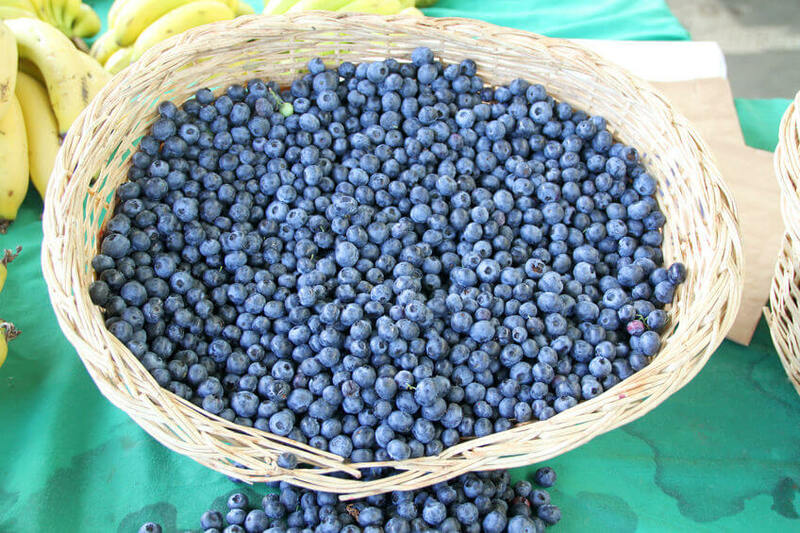 But more than that, the berries themselves are potential health boosters in a major way. 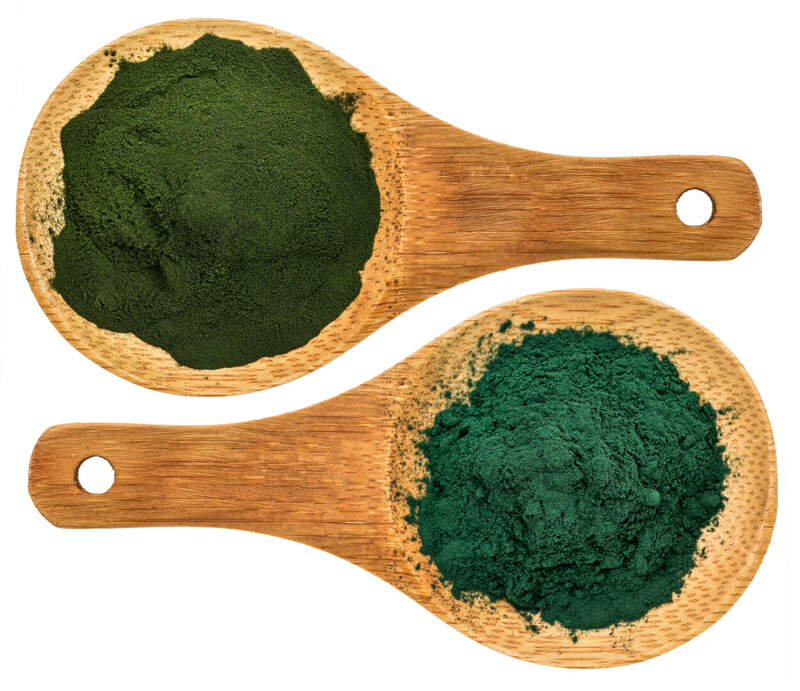 In fact, they are appearing as a key ingredient in many health supplements. Aronia melanocarpa, or, simply aronia, is a small, dark, cherry-looking berry plant that originated in the eastern part of North America.1 Aronia grows wild in swamps and in woodlands. In the 1940s, Russia began to cultivate aronia berries for commercial use. In the 1950s, Eastern Europe followed suit.2 Today, aronia berries are grown throughout the U.S. But why aronia? What makes it so special, aside from the fact that the plant itself is quite attractive in a garden? No wonder it’s called superstar superfruit! Several new studies have sought to solidify the sour berry’s role as a superfruit with potential health benefits. The results are certainly eye-opening. Growing vegetables is a common hobby, but it seems that less people tend to grow fruit, especially berries. Aronia berries are actually a really easy shrub to grow and, of course, you get a lifetime supply of free berries! Aronia shrubs (or chokeberry plant) come in several varieties – the black chokeberry, red chokeberry, and a hybrid known as the purple chokeberry. The names refer to, as you may have guessed, the color of the berries. If you’re keen to try growing your own aronia, the black chokeberry is the one to target. It has one of the highest levels of antioxidants of any fruit, and even more antioxidants than the red chokeberry. A black chokeberry species known as “Viking” is readily available, and you’ll find that it’s a lot less tart. It also has a stunning display of red and orange foliage during fall. Remember the first time you tried a fresh cranberry? I’m sure you’re puckering up just thinking about it. Well, the chokeberry is as tart as the cranberry (is that where they got the name?) so you’re probably not going to enjoy them straight off the bush. Aronia berries can be used fresh or dried (and, like cranberries, they often taste best dried) in just about any way you’d use other berries – salads, muffins, smoothies, and even tea. Freezing actually reduces their astringent flavor if you’d like to eat them fresh. 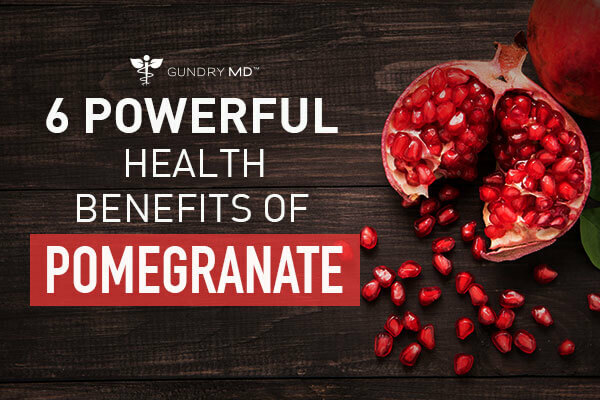 In fact, try substituting them for cranberries in some of Dr. Gundry’s recipes, such as his Cranberry-Orange muffins or Heart-Healthy Cranberry Slaw. Some winemakers are now using aronia berries to even make wines, as they are naturally high in flavorful tannins and can add body and color to a wine. Tannins are the antioxidant-rich polyphenols that we spoke of earlier. 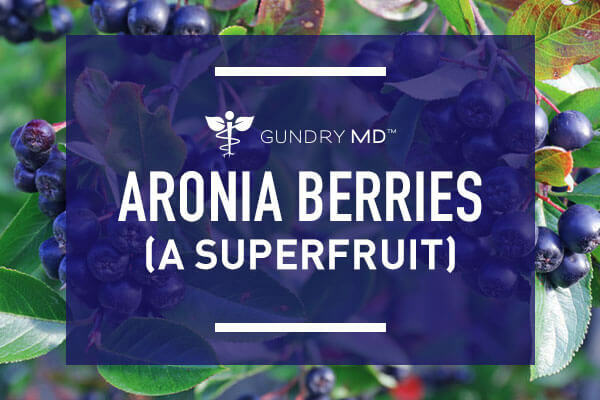 You can call the aronia berry whatever you want – a super berry, a superfood, or a superfruit. Just make sure the word “super” is in there, because it contains two to three times more antioxidant properties than any other berries. If there ever was a fruit on the verge of becoming a superstar, aronia is most certainly it! 1. Borowska S, Brzóska M. Chokeberries (Aronia melanocarpa) and Their Products as a Possible Means for the Prevention and Treatment of Noncommunicable Diseases and Unfavorable Health Effects Due to Exposure to Xenobiotics. Comprehensive Reviews in Food Science and Food Safety. 2016. doi:10.1111/1541-4337.12221. 2. Aronia Berries. Agricultural Marketing Resource Center Website.Revised October 2013. 3. Borowska S, Brzóska M. Chokeberries (Aronia melanocarpa) and Their Products as a Possible Means for the Prevention and Treatment of Noncommunicable Diseases and Unfavorable Health Effects Due to Exposure to Xenobiotics. Comprehensive Reviews in Food Science and Food Safety. 2016. doi:10.1111/1541-4337.12221. 4. Basu A, Rhone M, Lyons T. Berries: emerging impact on cardiovascular health. Nutrition Reviews. 2010;68(3):168-177. doi:10.1111/j.1753-4887.2010.00273.x. 5. Mikulic-Petkovsek M, Schmitzer V, Slatnar A, Stampar F, Veberic R. Composition of Sugars, Organic Acids, and Total Phenolics in 25 Wild or Cultivated Berry Species. Journal of Food Science. 2012;77(10):C1064-C1070. doi:10.1111/j.1750-3841.2012.02896.x. 6. Aronia berry: Rebranding helps a new superfood catch on. CBS news Website. Published July 14, 2014. 7. Wiederholt K. Aronia in North Dakota – They Do Sparkle!. 2016.Accessed December 1, 2016. 8.Tapiero H, Tew K, Nguyen Ba G, Mathé G. Polyphenols: do they play a role in the prevention of human pathologies?. Biomedicine & Pharmacotherapy. 2002;56(4):200-207. doi:10.1016/s0753-3322(02)00178-6. 9.Kedzierska M, Olas B, Wachowicz B et al. An Extract from Berries of Aronia melanocarpa Modulates the Generation of Superoxide Anion Radicals in Blood Platelets from Breast Cancer Patients. Planta Medica. 2009;75(13):1405-1409. doi:10.1055/s-0029-1185718. 10.Huang W, Cai Y, Zhang Y. Natural Phenolic Compounds From Medicinal Herbs and Dietary Plants: Potential Use for Cancer Prevention. Nutrition and Cancer. 2009;62(1):1-20. doi:10.1080/01635580903191585. 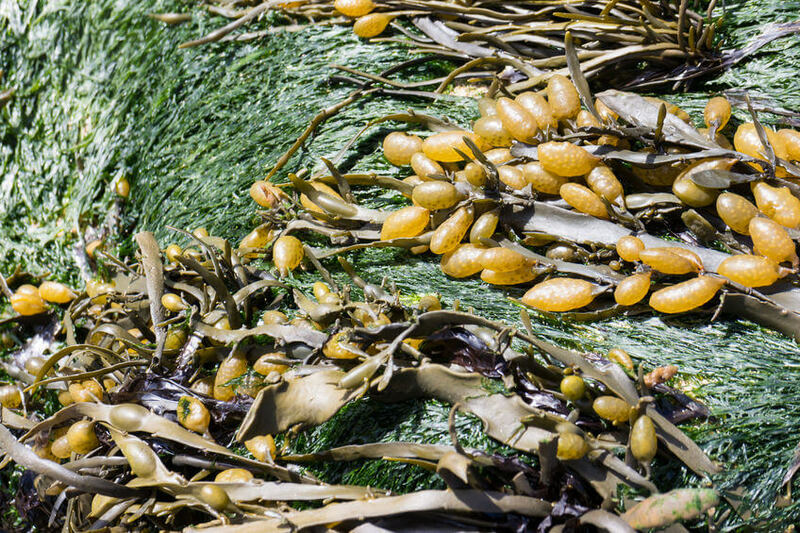 11.Scalbert A, Johnson I, Saltmarsh M. Polyphenols: antioxidants and beyond. The American Journal of Clinical Nutrition. 2005;81(1):215S-217S. 12.Everhart E. Aronia – A New Crop for Iowa. 2009. Accessed December 1, 2016. 13.Pandey KRizvi S. Plant Polyphenols as Dietary Antioxidants in Human Health and Disease. Oxidative Medicine and Cellular Longevity. 2009;2(5):270-278. doi:10.4161/oxim.2.5.9498. 14.Queen B, Tollefsbol T. Polyphenols and Aging. CAS. 2010;3(1):34-42. doi:10.2174/1874609811003010034. 15.Khurana S, Venkataraman K, Hollingsworth A, Piche M, Tai T. Polyphenols: Benefits to the Cardiovascular System in Health and in Aging. Nutrients. 2013;5(10):3779-3827. doi:10.3390/nu5103779. 16.Li S, Zhao P, Tian H, Chen L, Cui L. Effect of Grape Polyphenols on Blood Pressure: A Meta-Analysis of Randomized Controlled Trials. PLOS ONE. 2015;10(9):e0137665. doi:10.1371/journal.pone.0137665. 17.Broncel M, Kozirog M, Duchnowicz P, Koter-Michalak M, Sikora J, Chojnowska-Jezierska J. Aronia melanocarpa extract reduces blood pressure, serum endothelin, lipid, and oxidative stress marker levels in patients with metabolic syndrome.Med Sci Monit. 2010 Jan;16(1):CR28-34. 18.Vita J. Polyphenols and cardiovascular disease: effects on endothelial and platelet function. The American Journal of Clinical Nutrition. 2005;81(1):292S-297S. 19.Manach C. Polyphenols and prevention of cardiovascular diseases. 2005. Accessed December 1, 2016. 20. Kilham C. Aronia: The North American Super Berry With Cancer-fighting Properties. Fox News Published June 7, 2013.